The shots rang out from the land, the sea, and the air. Hunters—cold, wet, and cramped in their efforts to remain motionless—waited for hours in ambush, hoping to entice their prey with apples, corn, and fresh cedar boughs. When no more animals came to the bait stations, sharpshooters, imported from New Zealand, scrambled from skiffs onto the island and across jagged, seaweed-covered rocks, chase dogs in tow. The dogs cornered their quarry in the forest or drove them onto the beach to be picked off from the boats, while stragglers that sought refuge in inaccessible terrain were sniped from helicopters. As we round the rugged seaward coast of Ramsay Island in the central British Columbia archipelago of Haida Gwaii off Canada’s storm-lashed west coast, Judson Brown and Tauren Collinson recount stories of their involvement in the hunt and share nervous chuckles over a few tricky moments—hefting dogs out of boats, pulling people out of the bone-chilling Pacific, chasing prey through the surf. They can laugh now, but there’s nothing funny about the tense events Brown and Collinson are recollecting: the 2017 attempted eradication of invasive deer from Ramsay and five other locations in Gwaii Haanas National Park Reserve, National Marine Conservation Area Reserve, and Haida Heritage Site. While the park’s official title might be a complex jurisdictional mouthful, Brown and Collinson’s connection to it is straightforward. Both are members of the Haida Nation and, at the time of my visit, employees of Parks Canada, partner organizations that jointly oversee the 1,470-square-kilometer park reserve and an ambitious ecological restoration project known as Llgaay gwii sdiihlda—Restoring Balance. Following a successful multi-year program of eradicating invasive rats from six islands, the additional removal of deer under Restoring Balance aims to create an invasive-mammal-free zone in Juan Perez Sound, at the heart of the park. To this end, deer are being removed from the Bischofs, a group of five islands and a few islets, as well as Faraday, Murchison, House, Hotspring, and Ramsay Islands. Round one—the 2017 population knockdown—bagged almost 600 deer; over 400 from Ramsay alone. That six-month effort included hunting at baited ambush stations and along the shoreline, followed by a dog- and helicopter-assisted “mop up.” The hunters easily scrambled around Ramsay’s rugged terrain, aided by the very reason for the cull: the towering temperate rainforest had been browsed clean of its typically lush understory, and along with the plants had disappeared fungi, invertebrates, birds, and native mammals reliant on them. Removing deer allows the plants to regenerate, supporting the return of native biodiversity and rebuilding ecosystem resiliency. 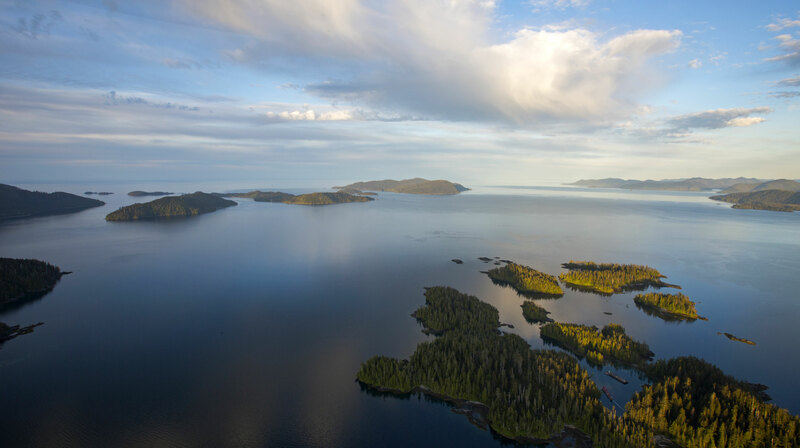 For the Haida, who’ve occupied these islands for some 13,000 years, it will also revitalize a lost food source and botanical medicine chest—ethnobotanical surveys here cite over 150 species of plants, many of which have been decimated by deer. 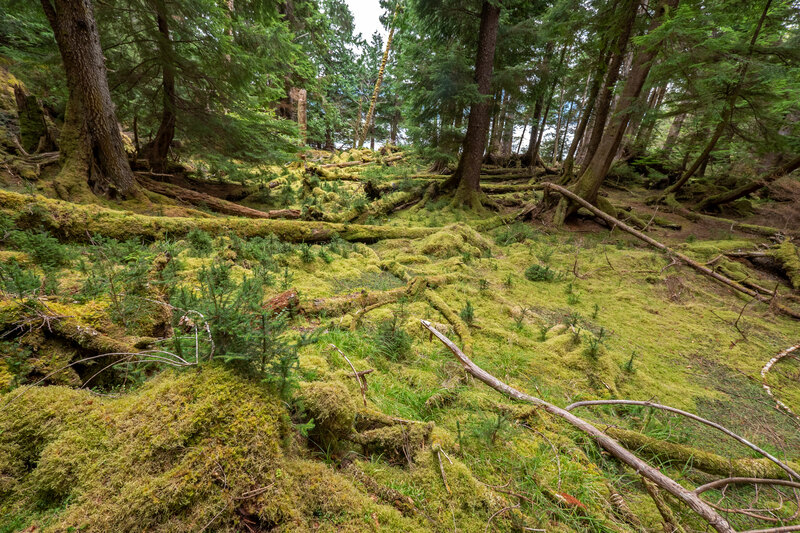 If ecological restoration is an act that expresses love for an environment and hope for the future, Restoring Balance stands as a bold and important collaboration for an additional reason: with Canada engaged in broad-based social and political reconciliation with Indigenous peoples, the dual restoration of biological and cultural integrity in Gwaii Haanas constitutes a form of ecological reconciliation. On a map, Haida Gwaii floats off the coast of British Columbia like a long wedge of pizza, with a 100-kilometer-wide crust in the north tapering to a point some 300 kilometers south. Of the archipelago’s approximately 350 islands, over 200 lie within the boundaries of Gwaii Haanas, which comprises the southern third of the chain. Haida Gwaii has been called the “Galapagos of the north” for the many endemic species and subspecies that evolved there while it was an ice-free refugia during the height of Pleistocene glaciation. Several plant species and a type of slug—as well as genetically distinct forms of more widespread species such as the hairy woodpecker, saw-whet owl, Steller’s jay, Peale’s peregrine falcon, black bear, and pine marten—are all found here and nowhere else. But numerous introductions of nonnative organisms now threaten this unique biodiversity. And while the litany of harmful aliens includes plants, insects, frogs, rats, and even beavers, a hyperabundant ungulate has the most widespread impact. Sitka black-tailed deer were introduced to Graham Island—the northernmost, largest, and most populous island of Haida Gwaii—as a food source at least six times between 1878 and 1925. Aided by mild winters, a lack of natural predators, a low human population, and the browse-rich shrub landscapes left behind by clearcut logging, the deer population took off, rapidly reaching carrying capacity. New food sources were only a quick swim away, however, and by mid-century, the cervids had island-hopped to the archipelago’s unpopulated southern terminus, grazing down forest understory and intertidal forage on all but the most isolated islands. In particular, overbrowsing severely suppressed the regeneration of ts’uu (western red cedar), considered the tree of life by northwest coastal peoples and a central element in Haida culture, used to craft everything from clothing, hats, and baskets to housing, canoes, and ceremonial poles. This led to mixed sentiments about deer among the Haida: they were appreciative of the food source but concerned about the deer’s effects on berries, trees, and medicinal plants. “As with our language, stories, songs, names, and lifestyle, the plants and their uses are very much a part of what makes us who we are,” writes Haida cultural plant expert Barb Wilson in the epilogue of Nancy Turner’s 2004 ethnocultural treatise Plants of Haida Gwaii. 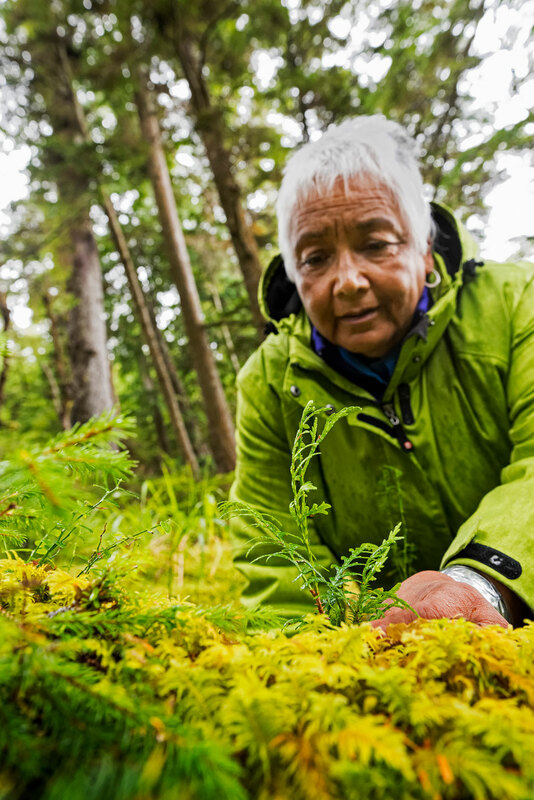 An ethnobotanist and professor emeritus in environmental studies at British Columbia’s University of Victoria, Turner collaborated with her friend Wilson and other elders to create a record of the traditional uses of a large catalog of plant species and their importance to the Haida. She sees initiatives like Restoring Balance as key to reinvigorating such knowledge. Turner explains that while there have been cumulative negative impacts from the loss of culture and language, they can be reversed by cumulative positive impacts. “Eco-restoration goes along with language revitalization and other acts of collaboration and reconciliation to bring about positive change,” she says. It’s late June 2018 when I join Brown and Collinson on a two-day trip to compare deer-free areas in Juan Perez Sound with those occupied by deer. One of our main objectives is to see how the ecosystem on Ramsay has responded to last year’s deer cull, but we’ll make a few other stops. Our first destination is Kunga Island, where the forest is still very much the domain of deer. Anchoring our large, closed-cabin boat offshore, we take a small inflatable raft to the sloping pebble beach. Walking up, we cross a tideline scatter of kelp and driftwood before reaching the forest’s edge. If we’d landed here a century ago, we would have had to pry our way through a tangle of shoreline vegetation girding the trees: various grasses and shrubs, and a dense thicket of salal—the leather-leaved relative of heather that is ubiquitous along North America’s west coast. On a strand like this, salal is typically so thick you need a machete to clear a path into the woods, but we simply stroll unimpeded into what resembles an empty coliseum of massive brown pillars sprung from AstroTurf. While a thick canopy of red cedar, western hemlock, and Sitka spruce closes high overhead, on the spongy moss below grow just a few shin-high spruce trimmed into tiny cones as if a leprechaun were farming Christmas trees. It’s a peculiar form of topiary—a bonsai garden tended by deer. The presence of these miniatures means they were already established when deer first arrived over a half century ago. Since the animals eat the soft new growth that forms annually at the tip of each branch, they’ve kept these decades-old trees stunted ever since. Once you understand such forest forensics, you start to see evidence everywhere. Farther inland stands another metric of invasion—a fenced plot erected in 1998 to study plant growth in the absence of browsing. The exclosure is packed with ferns, berry bushes, shrubs, and small trees, a hint of what the understory in this old-growth forest once looked like. Outside the fence, where deer are free to frolic, I spin 360 degrees with hands outstretched and touch nothing but air. Leaving Kunga, we skirt Lyell Island, where rapacious logging in the early 1980s kicked off a 1985 blockade by the Haida that ultimately led to the creation of Gwaii Haanas National Park Reserve. As we approach Windy Bay, one of five designated cultural sites in the park, a Haida watchman—an on-site guardian and interpreter—motors out to meet us; he’s excited to show us to a culturally modified tree (CMT) recently identified in a nearby lagoon. Once ashore, we duck along a trail and pass a remarkable red huckleberry bush, its main stem as thick as my arm. It’s the only huckleberry we see in a forest where they should be common. Blessedly out of reach of the island’s deer and certainly predating them, the plant is a true ecological relic. The CMT is a different kind of relic—an ancient red cedar with a two-meter-wide trunk that’s missing a strip of bark from its central section. The bark was pulled loose with stone tools in pre-contact times. When harvesting cedar, the Haida would cut only a small amount of bark from each tree before moving on to the next, maintaining the health of these culturally important trees. That cedar has been unable to regenerate on these islands for half a century, except in places inaccessible to deer, opened a cultural black hole that lent impetus to deer eradication. During the blockade, the Haida erected a longhouse at Windy Bay. The protest was never about stopping logging in the archipelago, but about ending the type of destructive felling being practiced on Lyell, thereby giving the Haida a modicum of control over their lands. The cultural and political awakenings shaped a young Judson Brown, who saw his mother arrested at the blockade when he was only 13. Now a boyish 46-year-old with a quick wit and an even quicker grin, Brown’s interests have always leaned toward the biological. “Growing up on the ocean with nature all around, I was always asking why-is-the-sky-blue kinds of questions,” he says. While completing a biology degree at what is now Vancouver Island University, he landed a job with Parks Canada that turned into a career. 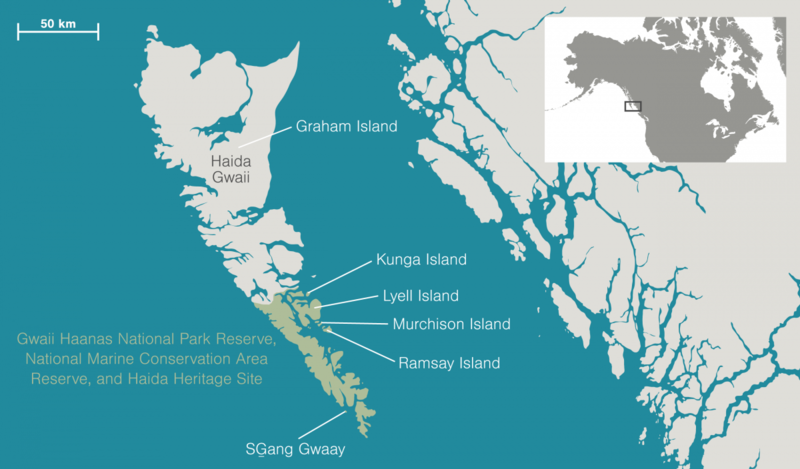 For two summers, he worked on the rhinoceros auklets that nested on SGang Gwaay, an island at the archipelago’s southern fringe with an eponymous UNESCO World Heritage Site famous for its village site and totems. Even in this far-flung locale, Brown battled the effects of deer, which mowed down plants that otherwise kept the soil moist enough for auklets to dig nesting burrows. “Deer would punch through the desiccated soil into burrows, then the birds would abandon them,” he recalls. Pre-deer photos of SGang Gwaay show it dense with salal. The more open understory around the archaeological site today is an unnatural state that paradoxically improves the tourism experience. 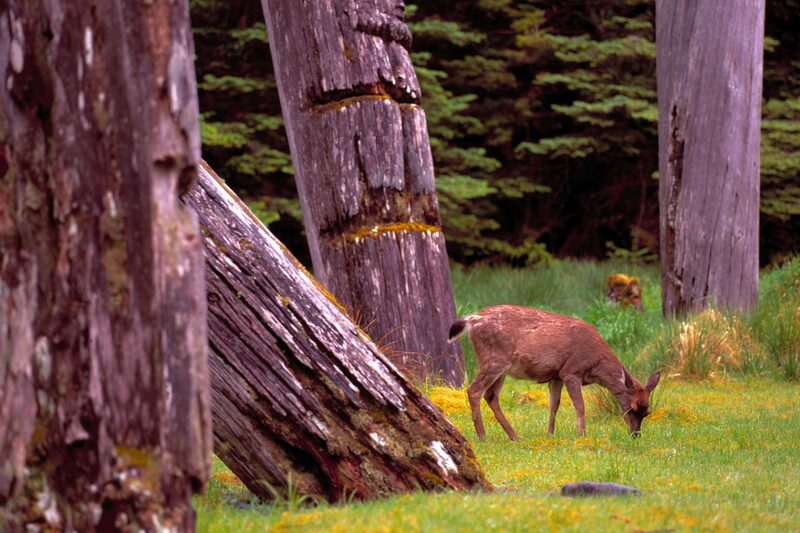 Because Haida tradition dictates cultural relics not be restored or propped up, but allowed to yield to entropy and return to the ground, deer may unwittingly extend the life of such artifacts by keeping them clear of plants. Eventually, for both cultural and environmental reasons, a test cull was carried out on SGang Gwaay from 1997 to 2003. Most deer were removed in the first year, but the stragglers were never fully eliminated, reaffirming a widely held adage of invasive species management—you expend 90 percent of your resources to tackle the last 10 percent of the problem. As we leave the protection of Windy Bay, the waves begin to rise ahead of a threatening storm. Gripping the helm as we bounce along, Brown reflects on his work in the park with an air of nostalgia. This is his last trip as a Parks Canada employee as he’ll soon take up a post as marine planning program manager with the Haida Nation. It’s fitting then, that the boat he’s piloting is something of a spirit craft: its Haida name, Haaja, means rhinoceros auklet. When Brown started working for Gwaii Haanas, it was an understaffed initiative operating out of a trailer. This year, the landmark 1993 agreement between Parks Canada and the Haida Nation to co-manage the park marked its 25th anniversary. Having been part of the effort for 22 of those years, Brown experienced the changes and challenges as Gwaii Haanas grew to become a model of government and Indigenous cooperation. The park’s journey has been his as well. We overnight at the park’s operations center on Huxley Island in the southern reach of Juan Perez Sound, a small wooden cabin within striking distance of Ramsay Island. In the morning, it is sunny and still when we head out. As we approach Ramsay, the outlines of Hotspring, Murchison, and Faraday stack against each other in the distance, and it’s clear how removing deer from each will also serve a greater good: for a land animal unafraid to swim, these neighboring islands are stepping stones to Ramsay. Considered the jewel of Juan Perez Sound, Ramsay has never been logged, nor, so far as is known, hosted a permanent settlement. It is free of invasive rats, raccoons, red squirrels, and soon, if all goes well, deer—it’s estimated that perhaps 10 escaped the 2017 dragnet. But once the last deer is gone, maintaining that pest-free status becomes the challenge. To back up eradication, Restoring Balance project manager Robyn Irvine has a plan to get ahead of reinvasion. 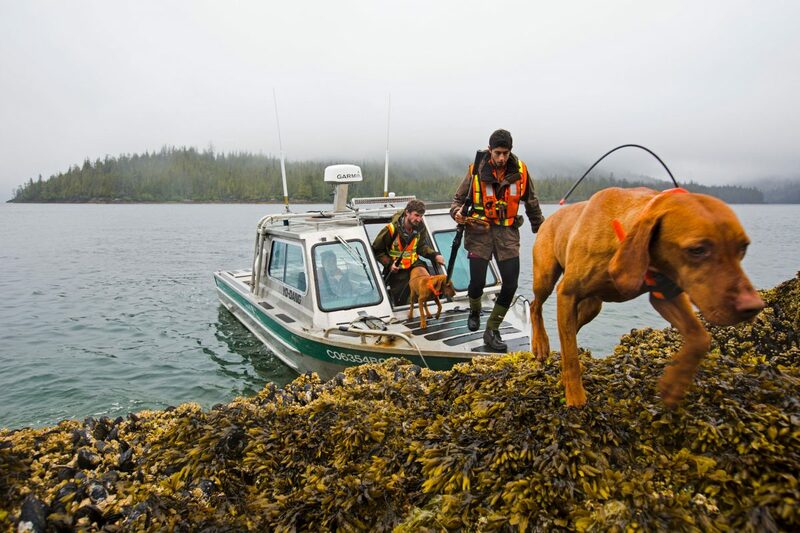 It includes DNA analysis of deer from various parts of Juan Perez Sound that will help ascertain their natural rate of movement between islands, as well as remote monitoring to detect and remove any reinvading deer before they reach high densities. If all goes well, Irvine tells me, full eradication should be achieved by the time the project wraps up in 2020. After rounding Ramsay, we anchor on the island’s calmer north side, raft to a wide beach, and slip onto a worn trail collectively etched into the forest by Parks Canada staff, sharpshooters, dogs, and deer. In the first clearing stands a Pacific crab apple tree, whose fruit is used for food, bark and leaves for medicine, and wood for tools. The tree has repeatedly attempted to sucker—sending shoots down from main branches to root and spread—but failed, as attested by nibbled-clean tendrils hanging purposeless in space. As a result, the tree’s only growth over 60-some years of deer occupation has been upward, atop branches beyond the animals’ reach. But now, after only a year without harassment, it’s suckering again, and a lone tendril roots firmly into a moss-covered log. The branch it hangs from is cloaked in new growth, as if the plant senses its sudden good fortune. Soon we track other changes. Just off the trail, Brown drops to his knees, the most animated he’s been on the trip, and leans into the moss with his phone to photograph white flowers swaying above tiny jade bouquets. The delicate beauties he calls single delight wouldn’t have stood a chance against grazing deer. At a stream gurgling in a lush, mossy trough, Brown kneels to examine a salmonberry plant, another hopeful returnee. “Many food and medicinal plants come from streamside environments like this,” says Brown, adding that one of the most treasured is devil’s club. Featuring large palmate leaves on springy, wooden stalks that bristle with skin-penetrating spines, devil’s club is an important medicinal plant—its inner bark and roots have been used to treat arthritis, digestive issues, tuberculosis, colds, skin disorders, and diabetes. The plant is slow-growing and takes many years to reach seed-bearing maturity, making it especially sensitive to impacts. Its paucity on Haida Gwaii is telling. 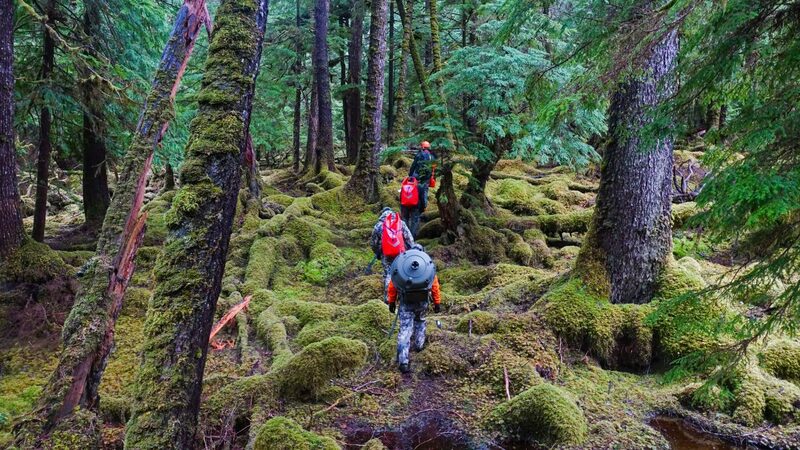 The higher we climb, the more we find: nurse logs carpeted in cedar and hemlock seedlings; prickly bonsai spruce fringed with soft, new chartreuse growth; the pillowcase-sized, emerald leaves of skunk cabbage fountaining out of moist hollows. It’s no riot of life, but rather the first tentative stirrings of a vast ecological healing—one that immediately lifts the heart. When I see my first salal, I want to hug it. “What really strikes me is the ability of these plants to persist, sending up shoots that get sheared off every year, then re-establishing when they finally get a chance,” says Brown. In fact, Restoring Balance is counting on such resilience. Irvine explains that after 80 years of disturbance, Parks Canada hopes that natural seed banks are still present in the soil. If these stores of viable seeds exist, then forest regeneration can happen passively. If they don’t, then restoration of the forest’s complex structure will require some human help. Regardless of difficulty, the 2013 cull was effective. Onshore, Murchison’s five-year growth is luxuriant. What was once a moss desert is now knee-high huckleberry bushes as far as the eye can see, the forest edge a berm of grasses, salal, and salmonberries. Inspired, Collinson and I engage in our own good-deed rehabilitation, digging out dozens of flowering invasive thistles before they seed, undaunted by the often Sisyphean nature of invasive control. Our tacit agreement to tackle the thistles hardly measures up to the complexity of the deer cull, but it’s in the same spirit as the formal working partnerships, shared decision-making, and active participation that Parks Canada and the Haida have embraced in managing Gwaii Haanas and its resources. This understanding extends to restoring traditional food systems and the harvest of anything—whether native or invasive. In the 2017 eradication effort, deer over 18 kilograms were professionally processed and donated to school and elder food programs. Some 635 kilograms of meat was delivered to the community, with hides sent to tanning workshops to be made into ceremonial clothing and leggings. 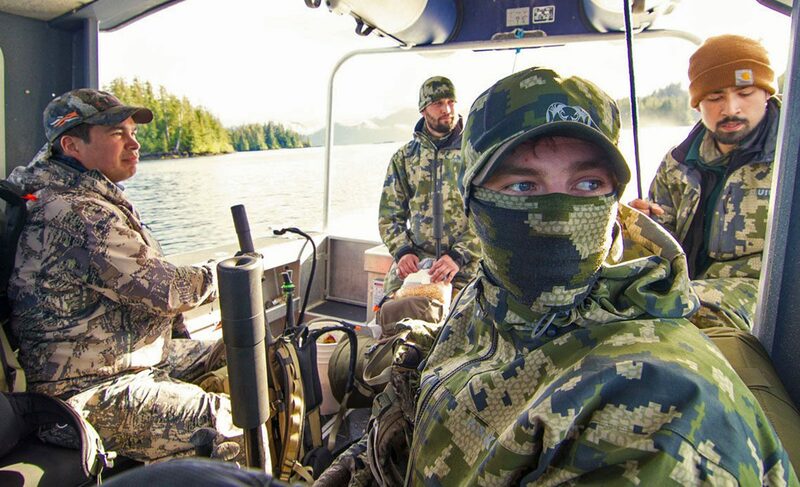 Most importantly, a hunting program for Haida youth will eventually include lessons on how invasive species can rupture both ecological and cultural heritage. Successful deer control, of course, doesn’t guarantee a return to pre-deer botanical landscapes—there are too many other factors at play. Still, while Ramsay’s rebound shows promise, and Murchison hints of what eradication can offer, you don’t need a crystal ball to see what the future could bring—just a quick trip to the past. As per its name, the last place Collinson, Brown, and I stop appears on few charts. Lost Island is a speck of only a few hectares but it’s a completely different world. “Listen to that,” says Brown as soon as we land, tilting his head toward the kind of dense greenery we have yet to see anywhere. Nesting oystercatchers stare us down with orange eyes, and as we move off the beach a peregrine falcon diving from a cliff sets off a cacophony of glaucous-winged gulls. I wade through a picket of grass, nodding wildflowers, and close-packed salal into a forest whose lower reaches are dense with false azalea, yew shrubs, and shockingly old alder trees. I immediately feel the moisture held in these shadows, and insects are everywhere; the sound of bees alone is mesmerizing. From the trees, crows, eagles, and myriad songbirds join the aural landscape. Lost Island literally vibrates with the industry of native flora and fauna for a singular reason: deer have never been here. The difference is astounding. For both the huckleberry and the Haida, that can’t come soon enough. Leslie Anthony is a writer, editor, and biologist based in Whistler, British Columbia. 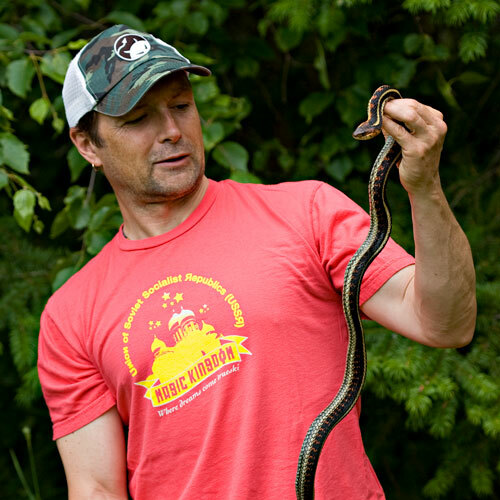 His adventure travel, science, and environmental writing appears regularly in magazines such as Canadian Geographic, British Columbia Magazine, and Mountain Life Annual. He is the author of several books. His latest, published by Yale University Press, is The Aliens Among Us: How Invasive Species Are Transforming the Planet—and Ourselves. Cite this Article: Leslie Anthony “Deer Wars: The Forest Awakens,” Hakai Magazine, Jan 22, 2019, accessed April 26th, 2019, https://www.hakaimagazine.com/features/deer-wars-the-forest-awakens/. Tireless in her quest, ethnobotanist Nancy Turner works with indigenous elders to preserve plant knowledge dating back to the First People in the New World.